An extract from Highways of Turton by James J. Francis, pages 60-69. Turton Urban District Council took its new responsibility for roads very seriously. It had a programme of resurfacing the main roads with stone sets to stand up to the increasing weight of the horse wagon traffic and the `new` steam traction engines. The weight of these steam engines alone varied up to twenty tons with fuel and water. They were capable of drawing two or more wagon trailers, and the total load on the road could easily reach fifty tons. 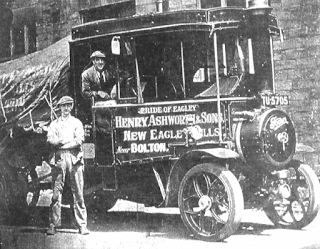 Several of our local manufacturers are known to have used steam traction engines or steam lorries including Ashworths of New Eagley Mills, Hardcastles of Bradshaw Hall Bleach Works as well as J J Walsh and Company of Cox Green Quarries. Internal combustion engined vehicles began to appear just before the 1914-18 War. Horse drawn traffic was still the main means of moving goods and all our local bleach works, textile mills and paper works had their own stables or used subcontract carriers. Horrobin Mill had extensive stabling for a dozen horses as did Bradshaw Bleach Works. By the end of World War I, there were fewer horses and carts operating from the many works of the area. 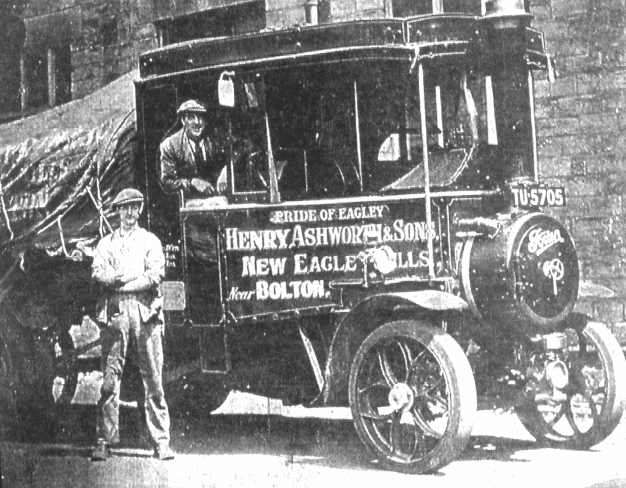 Bradshaw Works had sold their horses by auction a few years earlier and changed over to steam driven lorries which after the war were gradually replaced by petrol engined lorries. The introduction of inflatable tyres reduced road damage significantly as well as increasing driver comfort. 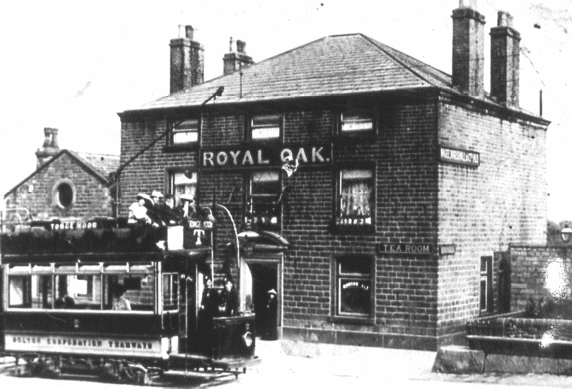 The old horse buses operated by the Holdens had been replaced by horse trams using rail tracks laid by Bolton Corporation. These in turn were replaced at the end of the century by electric tramways. Two sets of tracks were laid into Turton UD, the lines from Bolton to Dunscar Bridge and Bolton to Bradshaw Brow. outside the Royal Oak Inn, c1902. During the tram mania in 1902, bold plans were proposed to extend these lines to join the Darwen tram system, with a branch line to Belmont. There was also a plan to link Edgworth with Tottington. Neither proposal was followed through! In 1922, the Government decided that all roads should be classified in order of importance. The Class I roads were designated `A` and the Class II roads `B`. Numbering in England and Wales was based on six main arterial roads radiating from London to the coast starting with the London to Edinburgh road (A1), the Dover road (A2) and clockwise for the other four arterial roads ending with the Carlisle road (A6). All other main roads were numbered according to the sector between the arterial roads in which they originated (again in a clockwise direction). 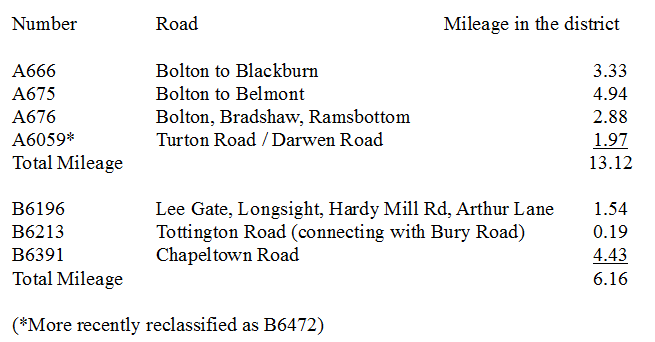 Thus the major roads in our area are prefixed A6, eg A675. The other roads classed as `District` roads remained the responsibility of Turton Urban District Council until 1946 when, depending on traffic flow, they could become Class III roads with grants made available for maintenance from the County Council Highway Authority. The Highway Authority established road building standards and all Planning Applications affecting roads had to be referred to them. Between the wars there was much unemployment in the industrial north and several far-seeing road building schemes were started, which apart from investing in the future of the area, helped to alleviate the suffering of mass unemployment. Local examples included the East Lancashire Road (1929-30) and in Bolton, the Ring Road (Crompton Way/Moss Bank Way/Beaumont Road). The latter was intended to by-pass the already congested town centre. After the 1939-45 War, local authorities were required to propose plans for necessary changes to improve the environment and try to correct the undesirable effects of the Industrial Revolution and two World Wars. Although not suffering the difficulties of most industrial towns, Turton Urban District Council put its mind to developing its administrative area for the future. To help formulate a strategy for the long term future of the district, the Council published its `Town Plan for the Urban District of Turton` in 1947. It was mainly the work of Mr Reginald Dart, the District Council Engineer & Surveyor and his department. It was assumed that existing industries would continue into the foreseeable future and necessary housing developments were planned mainly in Eagley and Bromley Cross with some in Bradshaw and Harwood. Apart from recognising the future needs for water, power and sewage services, improved housing, control of industrial areas and less ribbon development, a great need was foreseen for improved communications. The road system needed a complete review to avoid traffic problems in the future. Emphasis was made on protecting our historic heritage along with the open countryside. The recommendations for changes to our road pattern started with the assumption that the Oaks and Bromley Cross railway stations could be provided with more adequate facilities for both passenger and freight traffic. These proposals included an integrated bus and rail station with enlarged car parks at Oaks Station while Bromley Cross Station was given more emphasis for freight traffic to cater for expected industrial growth. Turton Urban District Council planned for future housing development in the south-eastern part of the district, hence it was felt that Bromley Cross and Oaks Stations should be the focus for communication development leaving Entwistle and Turton Stations, with their unsatisfactory access roads, for local needs. The scheme proposed a combined by-pass and semi-ring road. It originated on the Bolton to Bury Road (A58) in the east, at the boundary with Radcliffe Municipal Borough, and involved a completely new road through Harwood parallel to Longsight joining Bradshaw Road (A676) near Meadow Barn Farm. The road then passed over the Jumbles Valley and Bradshaw Brook, intersected Grange Road, went under the Bolton-Blackburn railway line and joined Chapeltown Road (B6391) near Prospect. It then followed a westerly direction joining Blackburn Road (A666) at Dunscar War Memorial. From this point the semi-ring road continued south to Bolton along the existing Blackburn Road. To give relief to traffic in Egerton, a loop was proposed from this semi-ring road north of Blair Hospital to follow the present route of Cox Green Road and join the Blackburn Road (A666) near the Cross Guns Inn. From a roundabout at this junction a road was to run across Eagley Brook south-west of Springside Paper Works to join the Belmont Road (A675) at the junction with Scout Road and then along the line of Scout Road to join the Bolton outer ring road. 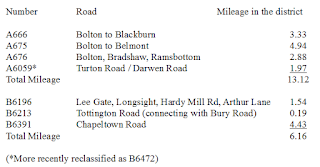 In addition to these by-passes, the scheme proposed the new `Birtenshaw Parkway` which was to run from a junction on Crompton Way to a proposed roundabout at the Oaks Station and then follow the railway to the new Civic Center to be built to the south of Turton School. The author, Mr Dart, makes clear in his proposals that the whole of Birtenshaw and Oaks Estate are subject to a 1932 agreement between the owners and Turton Urban District Council to preserve a permanent private open space. This was to prevent future developments, other than reasonable alterations to existing buildings and possible widening of adjacent classified roads. It was a legal matter that might be reviewed with the owners regarding a reasonable amendment to allow the building of the proposed `Birtenshaw Parkway`. There is no record of such an amendment being proposed. These by-pass roads were planned to be 100ft in overall width, while the Birtenshaw Parkway was to be a dual carriageway, tree lined boulevard with generous grass verges and a central reserve. This was to form the main gateway to the new town and perhaps a more beautiful and fitting approach would be hard to match. Possibly this was thought of as a `pipe-dream`, but if only some of the ideas had been carried through by the Turton UDC, or later by the Bolton MBC (after the 1974 administrative changes), the present morning and evening `snarl-ups` could have been reduced. 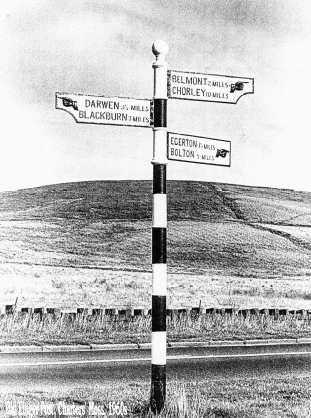 The `Birtenshaw Parkway` link to Crompton Way would have added a most welcome third link with the Turton area giving relief to the ancient highways of Bradshaw Brow / Tonge Moor and Blackburn Road. 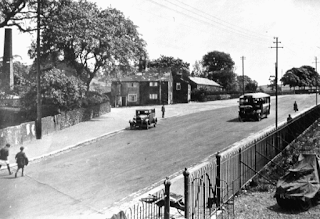 A newly straightened section of road at Hardy Mill, Harwood, c1935. Although no by-pass was proposed for the later heavily developed Harwood and Bradshaw areas, it seems a wasted opportunity not to have developed a link along the Bradshaw Valley to join with Crompton Way or Bury Road before the land was fully developed. Lancashire County Council were to the forefront of motorway construction in the 1960s and onwards, but none of their schemes have directly affected Turton, and to enter the motorway system we must still rely on the old turnpike roads. We must thank the Turnpike Trustees and the Enclosure Commissioners for their boldness and forward thinking in establishing the road system we now have. It is a sobering thought that over the last 200 years little has changed! Another long lasting legacy from the early 1800s is the network of footpaths and bridleways, some following the old highways overtaken by Enclosures and turnpikes, and many others established by the local inhabitants in their regular journeys over the centuries to work, worship and social gatherings.